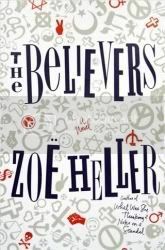 I received Zoë Heller's The Believers through Barnes & Noble's First Look program, and not knowing what to expect from the book, I can safely say that I was pleasantly surprised. Heller creates an incredibly interesting, if not a little strained at times, family dynamic and writes a compelling story about belief and what can happen to a family as those beliefs begin to be torn down. The book opens with the meeting of Audrey and Joel at a party in London in 1962. Audrey catches Joel's attention, and after a second meeting between the two when Joel invites himself along to meet Audrey's parents one day and then what appears to be a subsequent one night stand, they decide to travel back to New York and get married, all on a whim. Jump forty years in the future to New York City in 2002 and we find Audrey and Joel happily (unhappily?) married with two daughters and one adopted son. Joel is a radical lawyer who has made a name for himself as he takes cases that he feels upholds justice in its truest form, even when these cases can cast him in a bad light. Both raised as Jews but now casting off all religious ties, Audrey and Joel have raised their children with the same beliefs. When Joel suffers a massive stroke, Audrey is left to pick up the pieces and deal with her life the best that she can. As her daughter Rosa turns to Orthodox Judaism, her other daughter Karla's marriage seems to be at odds and her adopted son Lenny's drug habits spin out of control, a secret is revealed to Audrey that will test not only her belief in her husband, but also that of her children's beliefs in their father and family as a whole. The book has some witty moments to it too. I don't want to call them comical, but in a way they are. The one scene that particularly stood out for me, where Heller really shows how dysfunctional this family can be at times because they are so wrapped up in themselves and what they each deem as being their own personal importance is Audrey's birthday party. On the one hand I kept wondering if the scene was ever going to end because everyone was just so sarcastic, or angry, or indifferent; but at the same time, I think this is exactly why this scene stuck with me so well. Heller took each character to the extreme of their personality, and did it so well, that the scene looped around from being a farce to actually making me feel sorry for everyone in the family. Another aspect that I found very interesting is the information that Heller included about Orthodox Judaism. I admit a great degree of ignorance when it comes to most religion and its customs, and it was very interesting to read about some of the customs that the Orthodox Jews adhere to for their religion, and Heller does an admirable job of including this information. It appears to me to take a great amount of self-discipline to accept these sort of changes in your life, as it also appeared to Rosa, and that was them main crux of her characters growth in the book; discovering whether or not she had that discipline and was willing to give herself entirely to her beliefs or not. The Believers is an interesting study as each member of the Litvinoff family comes to terms with the beliefs that they have held on to over the years, the beliefs that are challenged in each other as their lives begin to take on their own shapes and the beliefs that they will need to hold on to in the future. The story takes place over the course of eight months, and we watch as each character de-constructs and reconstructs their entire belief system, be it either their religious, family or social beliefs. Sometimes their actions seem a little too dramatic, but overall the characters are believable and their struggles seem genuine. Zoë Heller's The Believers will be released in March and can be preordered at the link below or from your favorite local bookseller.